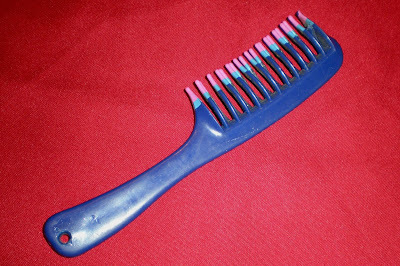 Here's proof of plastic's sturdiness: I've had this comb since high school, which makes it, ahem, 20+ years old. I use it every day. Click on the "Seven Clown Circus" button in the sidebar to see more Wordful Wednesday photos. I have some bits and pieces of high school utensils! Love the big comb, Baby! Isn't that a hoot! I'm not sure things are made that good anymore. I could never get a comb to last that long - back when I had hair. On the other hand, men's combs were never the industrial strength goodies that that one is. Can you get me a house like that? ahh... the power of plastic. My golden-mustard plastic measuring spoons have been around longer than I have.